All American Combo (30 Count Variety Bag). This combo bag comes with something for everyone. For the chocolate lovers, there are 10 Packs of Grandma's Chocolate Chip Cookies and 10 Mini Oreo. And, for those that are trying to keep away from the chocolate there are 10 bags of Welch's Fruit Punch fruit snacks. 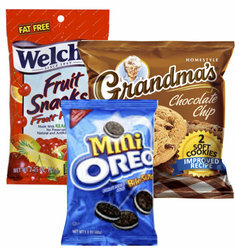 10 Grandma's Chocolate Chip Cookies, 10 Mini Oreo and 10 Welch's Fruit Punch Fruit Snacks.